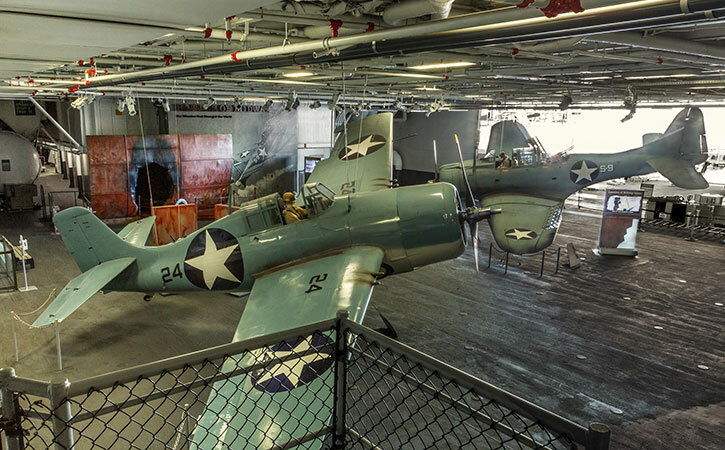 The exciting 100 seat Battle of the Midway Theater on the USS Midway aircraft is currently under construction in San Diego. 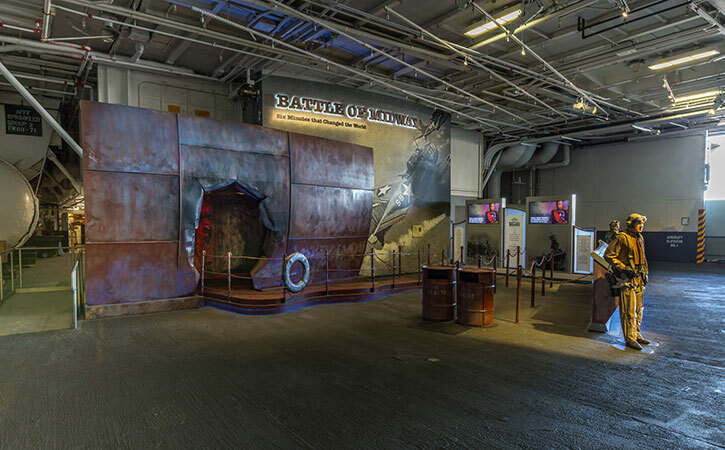 Docked and functioning as a museum, the USS Midway is providing an immersive theatre experience that will include a specially produced film complete with holographic special effects. The theater is located at the “forward” end of the Hangar Bay and include demolition and removal of many tons of steel construction. The theater is designed both to support the “show” but will also be capable of supporting other theater functions. One would never know by just viewing it, but the theater is actually a “box within a box” ….designed specifically for acoustic purposes. The walls of the exterior box are secured to the ship, while the walls of the interior box sit on a floating concrete floor that sits on special isolators. The interior walls that are secured to this floating floor are further isolated from the upper deck with similar isolators. The total thickness of both walls together is actually 14 to 16 inches thick after the addition of insulation. This “box within a box” is 18 feet high, and is located partially within a carved-out portion of a suspended mezzanine enclosure. 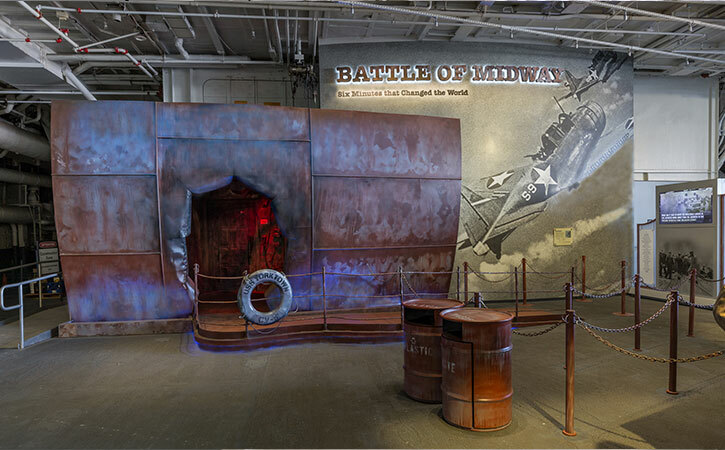 The interior space has an industrial aesthetic to coincide with, what we call the “ship ugly” nature of the Midway. 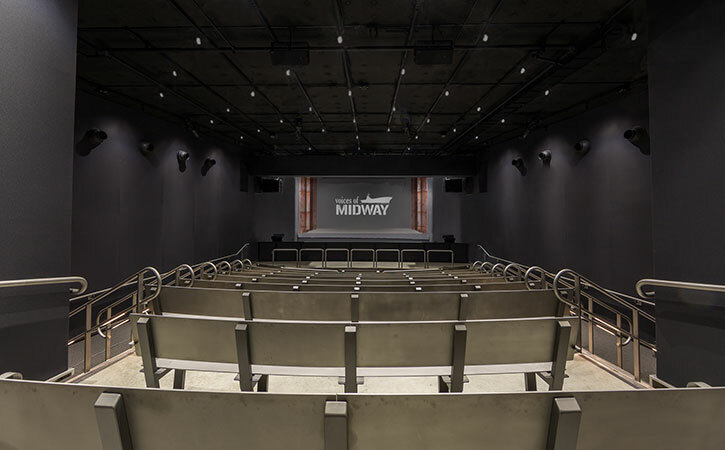 The space includes a film screen, holographic equipment, platforms, multiple projectors and theatrical lighting. Stadium style seating is laid out for quick access and exiting to facilitate multiple showings during the day.